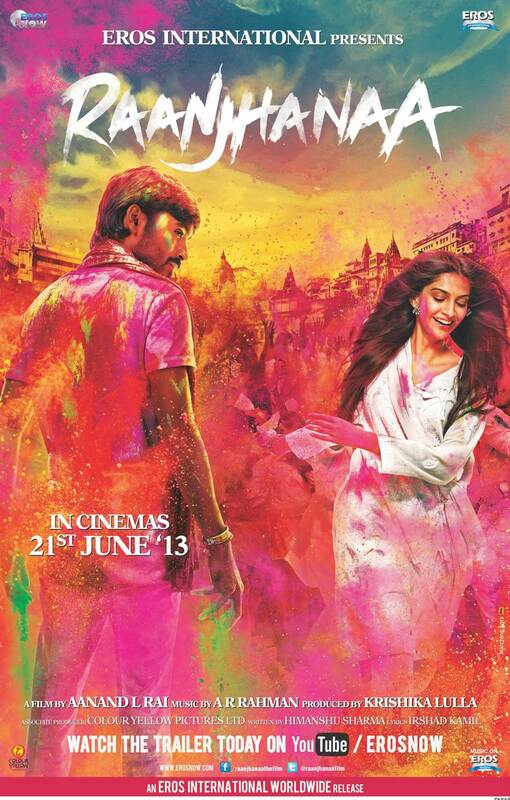 Raanjhanaa is not a conventional love story, and its two protagonists are not particularly likeable people, but their very human failings do make it possible to understand their mistakes. Despite their flaws I wanted their love story to succeed even as it seemed destined to fail. Dhanush never fails to impress with his acting but I was apprehensive about his co-star Sonam Kapoor since I’ve yet to see a convincing performance from her – and I still haven’t. But to be fair, Zoya’s self-absorption is integral to her character, so Sonam’s wooden and lifeless performance actually suits her character for a large part of the film. 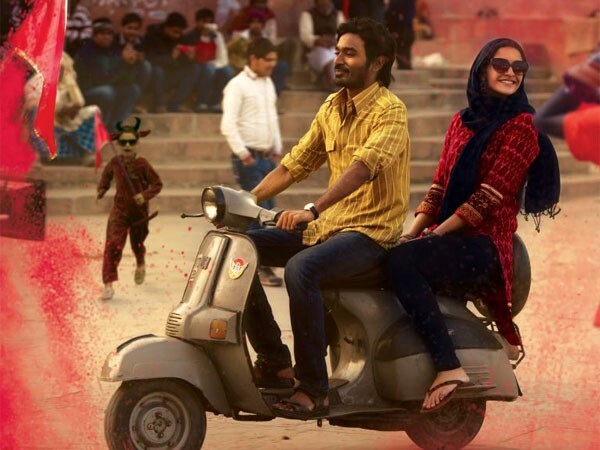 However Dhanush more than makes up for Sonam’s rather laboured performance and the support cast are all excellent, making Raanjhanaa a better film than reading Himanshu Sharma’s screenplay would suggest. The film opens with a group of child artists playing the roles of Kundan and his friends. The kids are charming and in a few short moments they define their characters perfectly, so that each further development makes sense given these childhood traits. Kundan falls in love with Zoya the very first time he sees her, despite the fact that she is Muslim, he is Hindu, and he’s only about 8 years old. His adoration at first sight develops into a full blown obsession by the time Kundan reaches his teens and his first stumbling attempts to tell the object of his affection how he feels are cringe-worthily appropriate for the ‘stalking = love’ concept that Indian cinema seems to prefer. I’m always amazed at how Dhanush manages to transform himself into a young teenager so effortlessly, appearing suitably gauche and naïve against Sonam Kapoor’s rather clunky attempt at adolescence. She lacks the vitality that made Shruti Hasan more believable as a teenager in 3, but there is some chemistry between the two actors which helps make the budding romance more credible. Unfortunately at this point there is the first of too many scenes which involve slashing wrists as a way to prove true love. It’s one of the things I particularly dislike since suicide as a plot device seems dangerous and irresponsible, especially considering the statistics on youth suicide in almost every country in the world. I can cope with the stalking, since Zoya definitely encourages Kundan (and I’ve been through the South Indian Cinema Induction Program) but I feel the wrist slashing is just inappropriate. The separation of the young lovers follows along fairly predictable lines, but what adds interest is the rival obsession shown by Bindiya (Swara Bhaskar) for Kundan. Swara Bhaskar is excellent as the girl so obsessed with marrying Kundan that she will do absolutely anything to get his attention. She really deserves to win the guy just for her devotion and ability to put up with Kundan and his best friend Murari (Mohammed Zeeshan Ayyub), but at the same time it’s obvious that Kundan would be a horribly abusive husband. Swara Bhaskar is full of vitality and energy and lights up the screen whenever she appears which is in stark contrast to Sonam Kapoor’s rather bland Zoya. Mohammed Ayyub is also well cast and does a good job as Kundan’s friend alternating between egging him on, and trying (usually unsuccessfully) to restrain his more dramatic impulses. Abhay Deol plays Akram, a student activist angling for election to government and the third member of the love triangle. While Abhay plays his part well he seems too old to be a convincing student leader, even one who is seriously considering a political career. Still, he does seem to have more to offer than Kundan, as demonstrated by the difference in their respective modes of transport. The story seems to lose its way in the second half as the love story gives way to the political campaign and there are a few too many contrived filmi coincidences as Kundan moves out of Benares and into Zoya’s world. But the changes in both Zoya and Kundan as their circumstances alter are well depicted and the consequences of their actions are shown to be greater than they could ever have imagined. As a teenager, Kundan’s every emotion is clearly visible on his face and his body language also transmits his feelings at every turn. With the transition to adulthood he becomes more restrained until by the end of the film Kundan is expert at concealing his true feelings and doesn’t allow any of his emotions to colour his conversation with Zoya. It’s a fantastic performance from Dhanush and director Anand Rai has drawn out every nuance in his character’s behaviour. After the first few scenes in childhood Sonam Kapoor keeps her stunned indifference expression throughout, but it is apt for Zoya’s personality so it does tend to work. She looks beautiful, but there is too much style and not enough substance in Zoya, particularly compared with Bindiya and even Akam’s sister Rashmi (Shilpi Marwaha). The music by A. R. Rahman fits perfectly and the dance sequences are well placed in the narrative and generally help to carry the story forward. 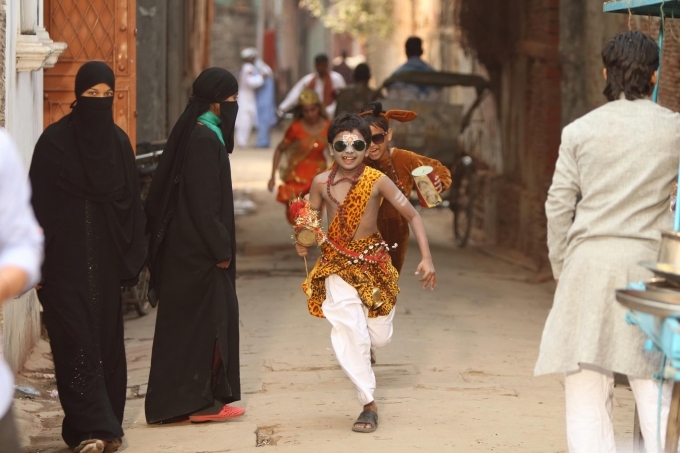 Benares looks like almost any other city in North India until there are shots of the river, and then it’s suddenly magical as Natarajan Subramaniam and Vishal Sinha bring the city to life with their cinematography. It’s an impressive debut for Dhanush in Hindi cinema, and he does well with the language too (at least as far as my inexpert ear can tell). Worth watching for a role that seems to have been made for Sonam Kapoor, an excellent performance from Dhanush and from the rest of the cast and a rather different view of “love”. This entry was posted in Bollywood and tagged A.R. Rahman, Abhay Deol, Anand Rai, Dhanush, Himanshu Sharma, Hindi, Mohammed Zeeshan Ayyub, Natarajan Subramaniam, Raanjhanaa, Shilpi Marwaha, Sonam Kapoor, Swara Bhaskar, Vishal Sinha. Bookmark the permalink. Really loved this review, almost 90% of my views are also same as yours. I never seen Sonam’s previous films, but when I saw this film I felt she has justified her role. Dhanush is a top class actor, so I never expect the lead pair to perform / express equal to him, because it would be pretty hard to match with his skills. Kundan’s character is very complex one, normally people should get annoyed/pissed the way he treats Bindiya, for immaturely cutting his wrists, for the big mess he created with Jasjeet ( u have referred Abhay as Akram ). But Dhanush’s magic works pretty well with Kundan, you never hate him for few mins, I can assure any other plain faced Bollywood actor acted in his role, not sure whether can expressed their love to Zoya with same intensity, expressed his guilt after knowing Jasjeet is dead because of him. It seems Abhay is a good performer in Hindi cinema, and Dhanush is a new kid in the block, so crowd support and loyalty would be obviously with the well known Abhay, but still Dhanush pulled it off with command. After Dhanush’s performance, I loved Murari (Zeeshan) and Bindiya (Swara). I like the entire film, including the second half, but wish the story writer sticked with Benares instead of shifting the story to Delhi in the second half, most of the political scenes in the second half reminded me that I am watching the ‘MOVIE’, but the first half gave me the impression that I am watching ‘REAL Characters’ in Benaras. So the movie kinda lost little bit of its innocence there. But I guess the story writer wants the story to be like a Shakespeare play with lots of characters and twists. But over all the movie is TOOOOOO good, really enjoyed it, Dhanush really rocked, and I am so proud of him. ( Btw myself and Dhanush share the same birthday, 28th July haha ). Thanks for your comment. I avoided writing about the second half as I didn’t want to give too many spoilers. One of the good things about the film was that I did care about what happened to Kundan, despite thinking that he wasn’t a particularly likeable person. He is horrible to Bindiya and very selfish in his approach to Zoya. Zoya lost all my sympathy as soon as she pretended to still like Kundan when she arrived back in Benares even though she was in love with someone else. Kundan at least was always very honest about his feelings. still, good to see characters with very human failings instead of all conquering heroes! I understand your feelings towards Zoya, but thats how we are in real life right ? We are not always good, sometimes when we need something we do act selfish ( upto what extent our selfishness takes us depends upon the way we brought up ), I did not feel Zoya pretended like she was still in love with him when she came back. Ofcourse you will always have a soft corner to a boy ( your first lover ) who cut his writst to win your love, but her way of looking into life got changed once she went to the big city, so she cant settle with someone like Kundan. But she selfishly uses him to stop the engagement with the Dr. But in the next scene when she was sitting behind Kundan’s scooter she casually tells about her love, she did not try to hide it from Kundan, so it clearly says that she did not love Kundan. But again she uses Kundan to convince her dad to accept Akram (Jasjeet). In the end she is taking revenge for what Kundan did to Jasjeeet, but after she came to know that Kundan already knew about the unrest which is going to happen in the rally makes her understand how much he loves her. So the guilt,love,sorrow mixed emotions comes from her in the end. I see many persons cursing Sonam, but I think she has accepted a really challenging character and played it well. May be not as commanding as Dhanush, but she has did well. Anybody can play Bindiya, she is very bubbly, so nice, very pure in her emotions. But Zoya is very complex with more Grey shade, we should appreciate Sonam just because she accepted this chracter, I see you are following Indian cinema very closely, how many such characters you have seen so far ? I assume it must be in single digit. I totally agree with you that there were many shades of grey in Zoya’s character, but I don’t think that Sonam did a particularly good job of conveying them. I didn’t think she conveyed the confusion I would have expected, or even any of the emotion, but I could accept that her way of dealing with everything was to completely close off from all her relationships. That’s why Sonam’s rather lifeless portrayal worked for me. Everything that Kundan did to pursue Zoya was because he loved her. He didn’t show any consideration for her feelings until much later in the film – when it was too late. That (plus the suicide attempt) were all very selfish. For all of Zoya’s shades of grey, she refuses Kundan saying that he is of different religion and it is impractical, while knowing fully well she is loving a different religion person. That is the height of manipulation. She could have been honest with him that it was childish love and to stop punishing her for it. He (and the audience) would at least respect that. BTW : Dhanush doesn’t speak Hindi at all, he couldn’t understand anything, not even the simplest of questions, in the press interview. PS In Oz in Nov, if some nice film is playing, maybe we can together one day? Will be in touch.. 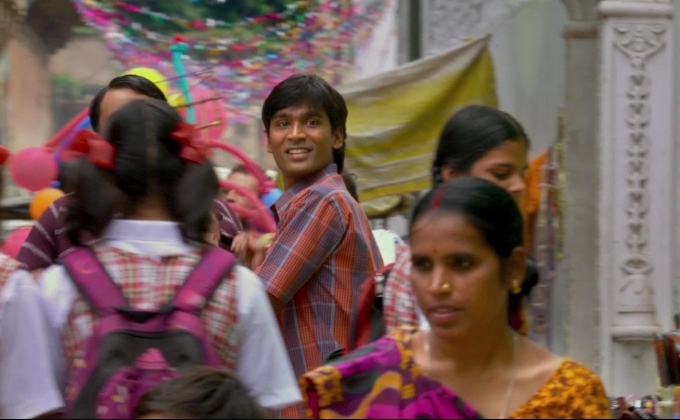 I am biased towards Dhanush because I think he is a fantastic actor, but the support cast in Raanjhanaa are also excellent. Less so Sonam Kapoor. Much as I love Dhanush, I don’t like his character here (which says a lot for his acting skills!) although I wanted him to redeem himself, which he almost manages to do before he blows it all in a very human mistake. I think you would cope fine with the first half, but probably, like me, have less tolerance of the second half where the film tries to become political while maintaining the romance and doesn’t pull it off. But the best reasons to watch it are Dhanush, Swara Bhaskar, Mohammed Ayyub, Shilpa Marwaha and Abhay Deol plus Rahman’s soundtrack. Maybe better as a DVD watch where you can avoid the wrist-slitting! If you do watch it, please let me know what you think. I’ve heard Dhanush in a number of interviews and his Hindi is pretty hopeless – which is why I couldn’t believe he dubbed for himself! He sounds fine in the film although I probably wouldn’t appreciate it if he had an accent. But compared to Prabhu Deva in ABCD his Hindi is fantastic! I watched this movie finally. 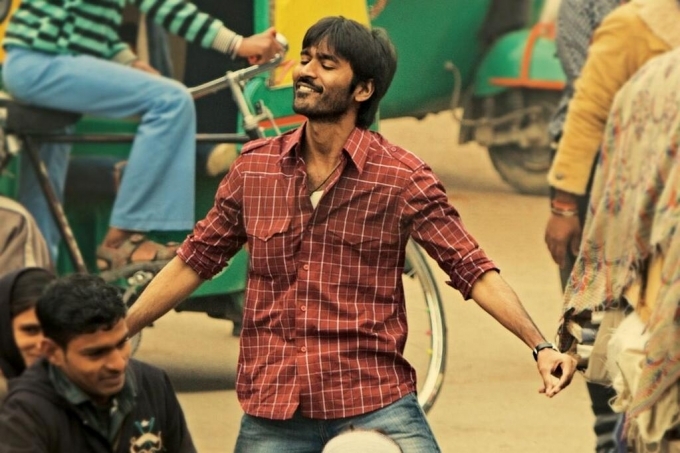 Dhanush is absolutely amazing!! His transformation from teenager to grown-up is so fantastic. What amazes me about this movie is the way he rides the bike in school dress. Reminded me my classmates in high school. His whole body language. I found Kundan to be likeable because of his naive actions. When he slices his wrist, he is not doing out of some defined selfishness but that is what a South Indian boy would do in any number of movies. He is taking cues from his culture rather than some well-thought out scheme on how to get the girl. The background dialogue goes as far as saying “If I was fair and handsome like a North Indian boy, I would have had a chance just by stalking. Since I am this dark South Indian boy, I have to do something extreme”. I think the actions of Kundan and his “love” make so much sense when viewed in the context of “Guna” (Kamal Hassan, 1991) and several others in that vein of doing anything for love (especially 80s-90s Tamil ones instead of Telugu ones of aughts). You can’t blame actions on specific persons when the whole culture and its role models give the message of “stalk, threaten suicide, die for love”. He is used by Zoya. She is the one who acts without fairness or integrity in the whole deal. She knowingly uses guys for her selfish reasons and without consideration of their feelings even after being a “cultured” matured young woman involved in ‘social’ causes. She should know better compared to “lived in the same street for the whole life and doesn’t know any better” Kundan. She knows she is sending mixed signals when she calls Kundan to her room the first time. Upper class girls don’t invite household-helpers for private meetings. His relationship with Bindiya was on a equal footing with give and take between each other’s harassment (Kundan was unlikely to be an abusive husband compared to ‘average’ husband’s behaviour of the culture shown. He would’ve more likely doesn’t-care husband, as most husbands turn out after a couple of kids). Zoya turns him to be cruel with her own cruel treatment of his love. It was entirely unfair for Bindiya to be left at the altar while Kundan discovers truth about Jasjeet. However, when Kundan really grows-up after the death of Jasjeet, he shows maturity. His love acquires a more self-sacrificial tone than the naive belief that impressing a young woman = love, or teenage love = marriage. Sonam Kapoor did nothing to show that Zoya suffered any guilt, shock, sorrow, vengeance, or love. She looked entirely pretty-upper-class-b**** thought the movie. There are shades of anger in some places (perhaps coming from petulance), but then Zoya didn’t become anything than what was written in the hands of Sonam. I would also vote for the first half more than the second half of the movie. 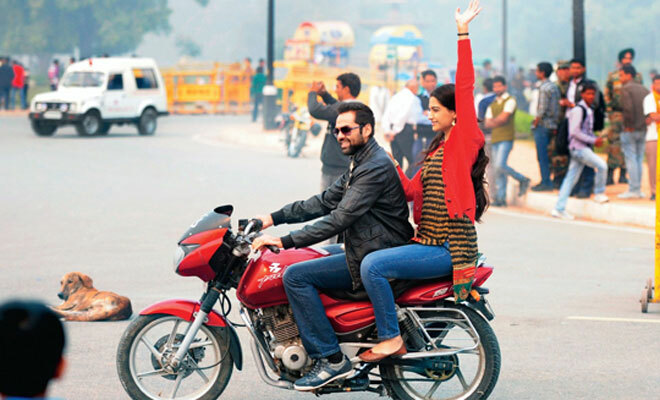 Abhay Deol was just too old to be seen as a student and looked like an uncle of Sonam instead of as boyfriend. Have you seen 3? That was the first time I saw Dhanush play a schoolboy and I couldn’t believe how well he carried it off – body language, mannerisms – just everything! I do think he’s a fantastic actor which is probably why I was so disappointed in Naiyaandi! Glad you managed to see the film and enjoyed it.